A bit of theory to better understand and appreciate; lots of practice and great discussion over a nice glass of wine… and voilà, you will understand the concept during our fun and friendly cooking classes. 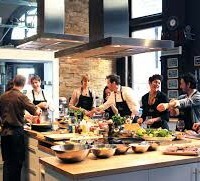 Of course, one of our professional chefs will lead the class in order to give you tricks and advice about Hungarian recipes. And then, after the effort comes the reward; your meals are ready, enjoy them in the lively atmosphere.